Avril Lavigne’s ‘Sk8er Boi’ single was released in 2002, when Sean was 10 or 11 years old; The Darkness’ ‘I Believe in a Thing Called Love’ came out in 2003. Sean really loved both these tracks in an innocent time before his musical taste began to mature, and the latter was probably a stepping-stone to the liking he developed for guitar rock and heavy metal not very long after. I remember him telling us earnestly that ‘Sk8er Boi’ (which I mention in my song ‘The Heat of Love’) had a great story … he always liked songs with stories to them. The premise of Avril’s hit (which reached number 1 in Ireland, but nowhere else) was ‘He was a punk/She did ballet/What more can I say?’ (quite a lot, as it turned out). The Darkness were a strange band … Justin Hawkins, the lead singer, was gifted vocally and as a guitarist, but (as far as I could see) they seemed to start out as a parody of glam/heavy rock, or of themselves, and then had nowhere to go, as nobody took them seriously (calling their second album One Way Ticket to Hell … and Back probably didn’t help). It might have been a better career move to postpone the ‘irony’ for 20 years or so, like Status Quo. ‘I Believe in a Thing Called Love’ is still irresistibly catchy, though. Hello Brendano. I remember that Skater Boy song when it first came out. At that time, my elder daughter was going through a phase of thinking that she was a skater girl, and she even had a subscription to a skater magazine. However, we never did see her doing amazing tricks like gliding down metal handrails and leaping over cars on her skateboard. I seem to remember the group ‘Busted’ from that time too. Same sort of innocent music with a clear storyline. Some time later, the boys removed the wheels of the skateboard, spray-painted it a fluorescent orange and used it as a sort of short surfing board for leaping dramatically into the lake. I like the photograph. 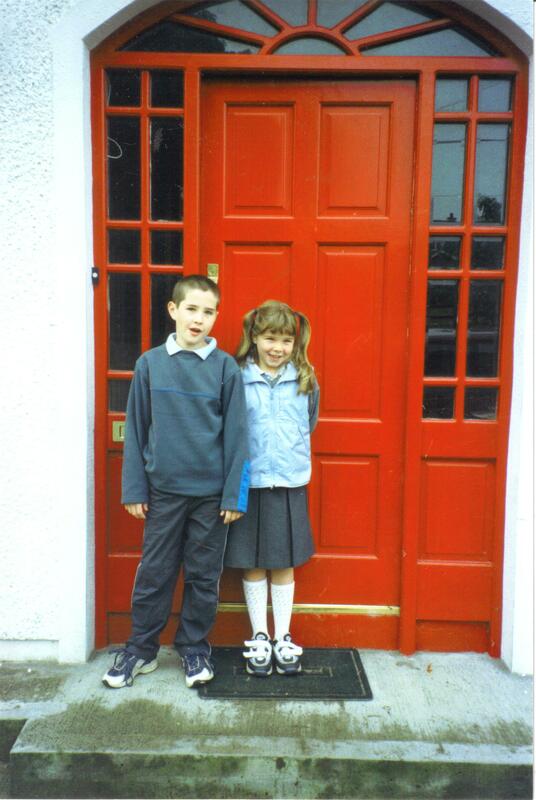 Beautiful children in front of a welcoming door. Hello Cymbeline … thank you. I had forgotten about Busted, but remember them now. Ours never got interested in skateboards, although you do occasionally see kids with them around here. I remember that there was a skateboard craze when I first moved to Dublin in 1977 … I was in digs, and the landlady’s sons were keen skateboarders. I never tried it. I am unfamiliar with the ‘The Darkness’. As ever, I am amazed by Sean’s wide range. In his short lifetime, he would have listened to far more music than I ever have.